VINTAGE COSTUME ANTIQUE JEWELRY MATCHING JEWELRY SETS - PARURES! 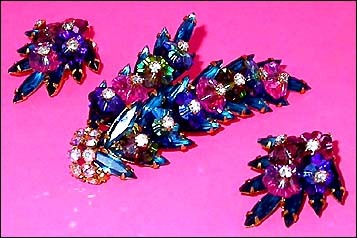 Juliana Multi Color Rivoli Crystal Rhinestone Goldtone Vintage Antique Estate Brooch Pin And Clip Earrings Matching Jewelry Set - Parure. Item #S168214 - Juliana Multi Color Rivoli Crystal Rhinestone Goldtone Vintage Antique Estate Brooch Pin And Clip Earrings Matching Jewelry Set - Parure. Size: Brooch: Length: 3 1/2". Width: 2". Height: 3/8". Earrings - Length: 1 1/2". Width: 1 1/2". Designer: JULIANA. Juliana is a style of jewelry which is highly collectible and sought after. It is not signed but is distinguishable and recognisable as pricey jewelry. 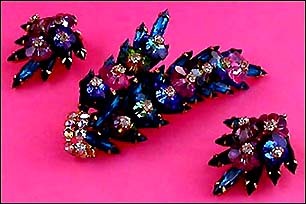 If the word 'spectacular' has not yet been invented, it should be for this spectacular Juliana brooch and earring set! No photograph can capture the stunning, vibrant colors and the richness of the stones. The brooch has two long rows of exquisite glistening navettes in lush teal. Each row is a slender fern design curving alluringly away from each other, partially overlapping and domed for gorgeous depthness. Then layered on top are strikingly beautiful rivoli flower crystals in various shades of green, blue, fushia and ameythst purple! The flower crystals radiate profusely in ice crisp brillance. That's not all it, each crystal flower is accented by a prong set glitzy clear rhinestone to draw even more attention to the flower crystals (as if this is necessary?!). The bottom of the two jeweled fern leaves are then combined by a shimmering Aurora Borealis clear rhinestone arched ribbon to complete the magnificent design. The glorious matching earrings radiant like two colorful peacock feathers. All the stones are prong set in rich goldtone metal. This Juliana beauty is in near mint condition as if it has been sitting in a vault for decades eager to adorn the wearer. A fabulous matching Jewelry set to wear at weddings, prom nights, pageants, parties, cruises and special functions! US$328.00. SOLD.